Published on Tuesday, October 1, 2013. 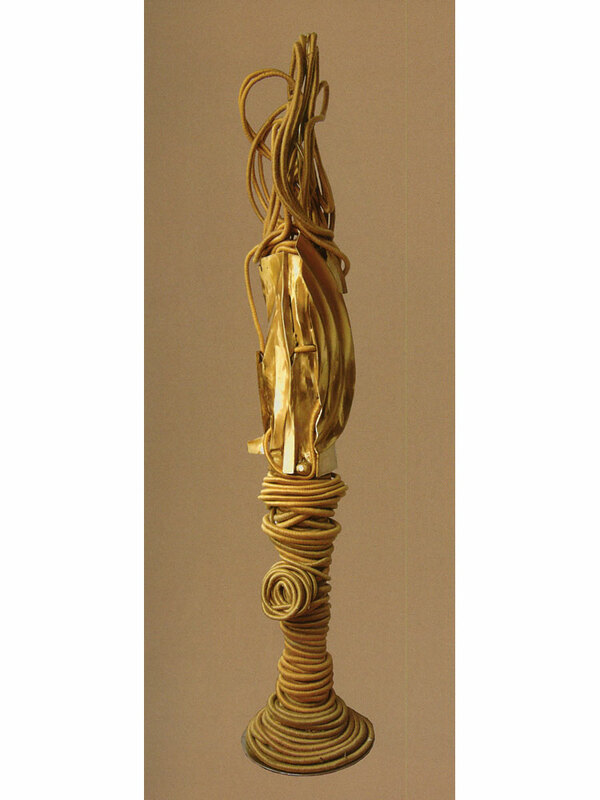 Barbara Chase-Riboud has never been a part of the contemporary craft community. 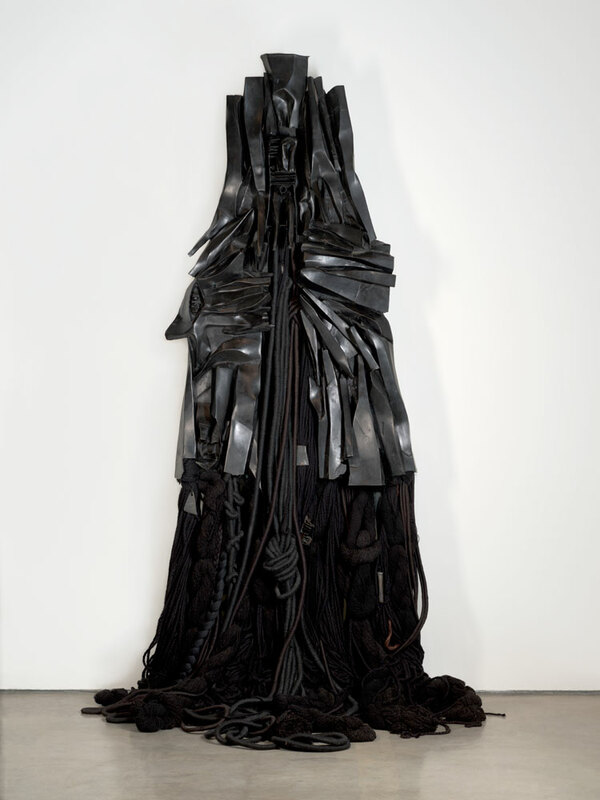 What makes her seem kin is her long friendship with Sheila Hicks (both are Yale graduates and for a time both lived in Paris) and, even more, the textile components of her imposing black bronze or polished bronze sculptures. Chase-Riboud, a Philadelphia native now based in Italy who is also a poet and novelist, is featured in a solo show at the Philadelphia Museum of Art (through January 20, 2014) consisting of sculptures and black-and-white drawings dating from the ’60s to the last decade. 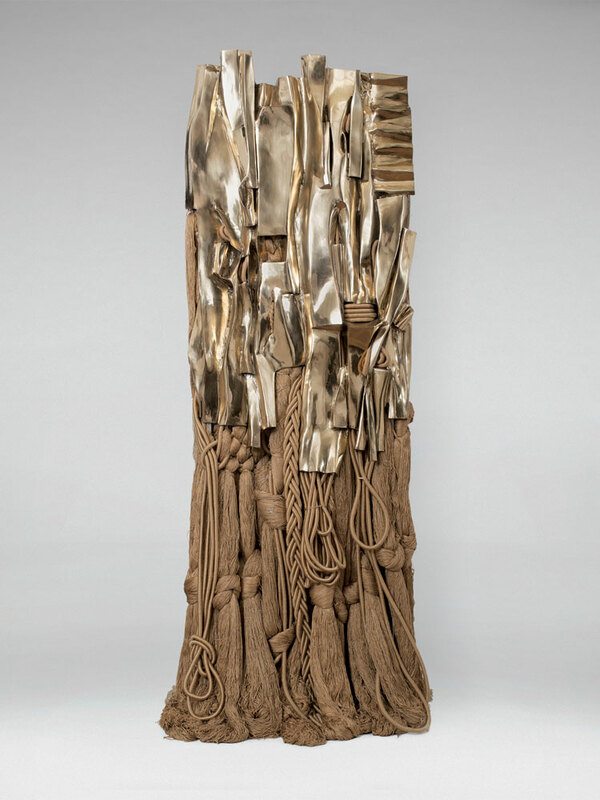 On display elsewhere in the museum (and part of its collection) was Chase-Riboud’s columnar bronze sculpture dedicated to the late Anne d’Harnoncourt, director of the museum until her sudden death in 2008. The show is titled “The Malcolm X Steles,” and although not all the sculptures come from that 13-work series, most consist of a frontal bronze relief that is vaguely figurative in its proportions and almost fractal in its surface character. 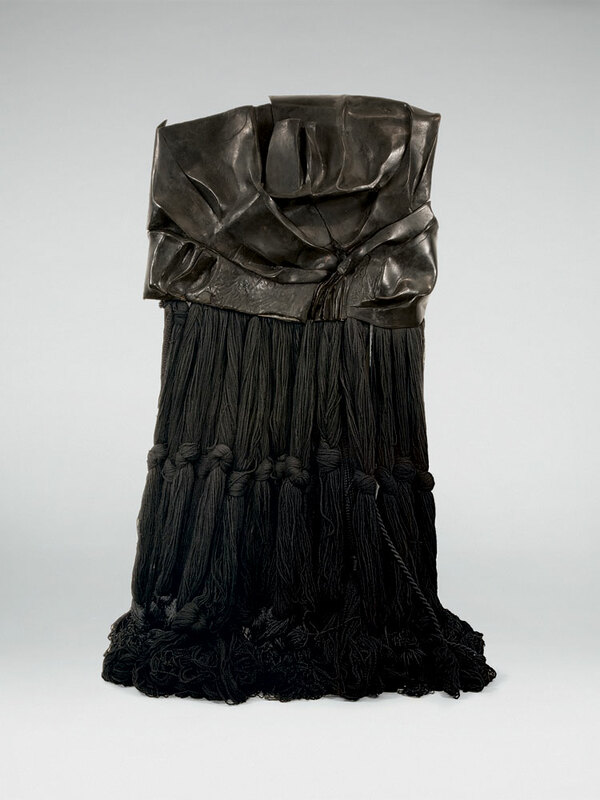 Below the narrow plates, hollow tubes, and crimped volumes of the metal — made by working flat on sheets of wax and casting a unique object directly — is a long expanse of black wool or ecru silk or synthetic silk. This “skirt,” the story goes, was Hicks’ suggestion of a way to cover the “legs” of the sculpture. But since Chase-Riboud is black, it has a poignant precedent in the raffia or reed additions on African masks. She joins clumps of yarn in large, loose overhand knots, or drapes long wrapped cords as thick as a thumb, or plaits threads into narrow braids. Each monumental work has a distinctive character: one is broad, another more open in structure, one is all verticals, and in another the black metal and wool are interrupted boldly (with a white wrapped cord) and gently (with fragile linen ties). There is no obvious progression in tone or detail or, for that matter, mastery. Chase-Riboud seems to have known what she was after from the beginning. The Malcolm X series, named in honor of the civil rights leader slain in 1968, began in 1969. Chase-Riboud returned to it in 2003-08. Malcolm X #2 (1969) is a horizontal rectangle of black bronze with a lustrous surface resembling slate or leather, from which falls a curtain of black wool, bundled with a row of large overhand knots, and one rope-like pair. Malcolm X #11 (2008) employs polished bronze along with silks that are glimpsed through openings in the metal and pour down in a great variety of forms and arrangements. A favorite of mine is the 10-foot-tall Confessions for Myself (1972), which might be a figure in a cape. Vertical elements of black bronze at the top turn to multiple horizontals — the angularity suggesting shoulders or elbows — and then back to verticals. Wool emerges at center just below a rectangular “heart” box. Wrapped cords sweep downward elegantly, while the lower fiber elements are arranged in multiple knots, in passages of thin braids resembling cornrows, and two distinctly brown and nappy loosened braids. Scattered clips of dark metal crimp the wool. It is a strikingly powerful sculpture, and especially impressive that a woman would use such a dominant form to refer to herself in those days. Hard and soft, contained and flowing, unified yet complex, massive and brazenly frontal, Chase-Riboud’s sculptures have lost none of their meaning or memorability. Janet Koplos is co-author of Makers: A History of American Studio Craft, published by the University of North Carolina Press.